So I'm going through Getting Started With Arduino. 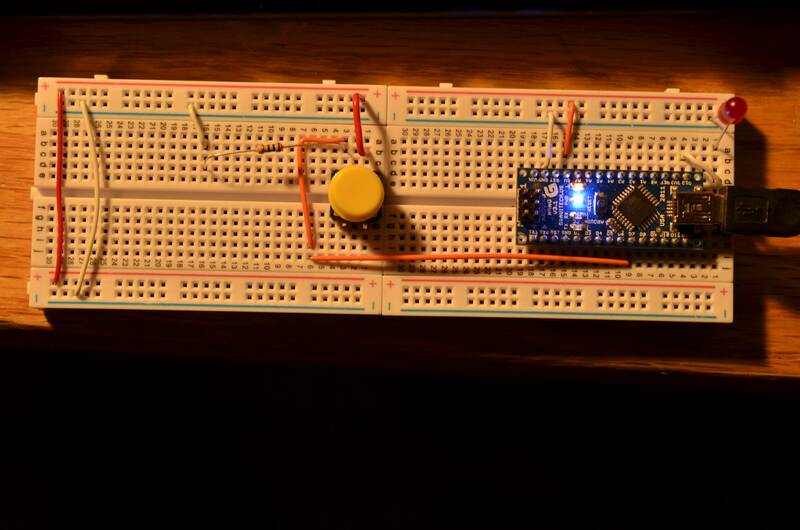 I skipped to making a LED blink when you press a button. First I wrote the code, then I copied it directly from the .pdf I have, neither has worked. Other than what what Nick Gammon said that you need the resistor from the board to led, as that will cause your microcontroller pins to get damaged. The other possible problem is the two breadboards you have put together, the power rails have not been bridged between the two boards. This means that the switch is not providing any logical state to the microcontroller. Also the only reason why the led is show in the book as a separate thing is that it is meant as an educational exercise to make you build something, the L led will do the same thing. Why can't I see the serial plot with the following code for arduino? I feel like an idiot, why can't I make a servo move with the boilerplate code? How to blink led and run another code at same time?